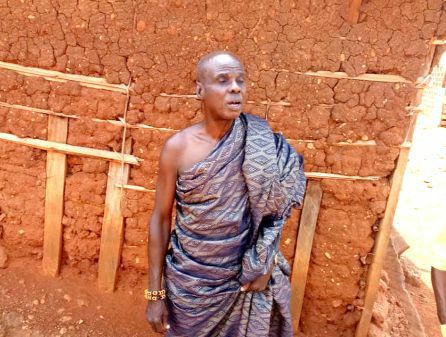 Residents of Bonkrom, a farming community in the Ahafo Ano South West District are appealing to the government to construct a health facility for the community. There is no single health post in the community so pregnant women have no option but to rely on the only traditional birth attendant (TBA) to deliver them of their babies. The closest facility is a health centre at Asibey Nkwanta, about four kilometres away from Bonkrom and inhabitants have to do the journey on foot as motorists are unable to ply the road on a regular basis due to its terrible nature. Nana K. Anane, the Odikro of the town, appealed to the district assembly to construct at least a Community-based Health Planning and Services (CHPS) compound in the community to cater for the health needs of the people. He said even access to communication was very difficult as one had to climb a hill or be at a certain location before one could have access to a network to call for help in case of an emergency. With the exception of Fridays, which is the market day for the next big town, Kunsu, he said vehicles were hardly seen in the area. Most often, one would have to pray that a motor bike would bring someone from Kunsu to the community and then board or do the 12km journey on foot to Kunsu. The community, could be described as a cottage with about 500 inhabitants and almost everybody knows every one. Surrounding the village are plantations of plantain and cocoa intercropped with cocoyam and other food crops. Most of the houses in the community are made from mud with the exception of the churches and schools which are built with cement blocks. Owing to the secluded nature of the community and the distance from the main road, the people eat virtually what they grow as commercial vehicles only come to the community on Fridays which is the market day of Kunsu. There is virtually nothing in the town that would attract anyone from a nearby town to want to live there. There are only two solar-panelled streetlights to light up the town at night and residents rely on battery-powered electrical gadgets to stay in tune with the rest of the world. The town also has two boreholes that serve the water needs of the inhabitants. According to the head master of the Bonkrom DA Primary, Mr Kwame Yeboah, the school had only six teachers, including a Nation Builders’ Corps (NABCO) person for the eight classrooms. For instance, he said, the kindergarten section was being handled by one teacher, same as class one and two and class three and four. He was, however, hopeful that more teachers would be posted to the school as the town would soon have a JHS following the donation of a three-classroom block to the community by International Cocoa Initiative (ICI) as part of its child protection project in cocoa communities in the country. ICI ISan international, is a non-governmental organisation that works to improve the lives of children in cocoa-growing communities by supporting the acceleration and scale-up of child-centred community development and responsible supply-chain management throughout the cocoa sector.